Whether playing thrilling Jazz compositions in concert with the Klobas/Kesecker Ensemble or enchanting renditions of pieces from the Great American Songbook for private or corporate events, Tommy always brings tremendous passion and skill to everything he does. Tommy’s musical vision is masterfully portrayed on two recordings with the Klobas/Kesecker Ensemble, which he co-leads with double bassist Pat Klobas. Their debut CD, “No Gravity,” (2008) delivers a rich tapestry of original pieces and fresh takes on some well-known Jazz classics, with world-renowned tabla master Zakir Hussain contributing some delicious Indian flavors to the mix. 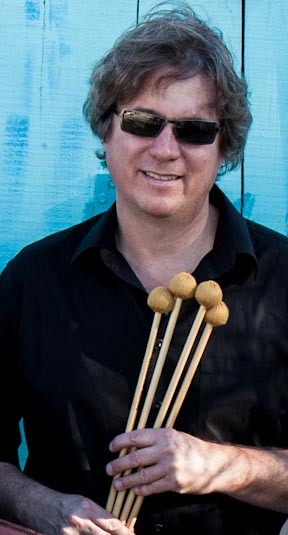 The Klobas/Kesecker Ensemble has launched its brand new release entitled “Moment’s Notice,” featuring Tommy on vibraphone and marimba, Pat Klobas on double bass and electric bass, David Rokeach on drums and Terrence Brewer on electric guitar. Check out their vibrant interpretations of compositions by John Coltrane, Steve Kuhn, Michel Legrand and others, along with a stellar batch of original compositions for your enjoyment. Visit Tommy’s Store page <URL here> to hear samples and to purchase your copy. Also be sure to click on the pages below to find out how to book Tommy’s ensemble for corporate and/or private events, to see where he is performing and to sign up for lessons.